On 20th July 2009, as Falun Gong practitioners marked ten years of anti-persecution, a series of activities were held including a discussion session in Parliament entitled “China Tragedy” in the afternoon of the 15th of July, an anti-persecution parade and activities in the centre of London on the 18th of July, and a large scale gathering at Parliament Square themed “Dissolve the CCP, Stop the persecution” on the 20th of July. Some British politicians and NGO representatives came to support. In their speeches and interviews, they called upon the UK government to act immediately, uphold religious liberty, and help stop the CCP’s brutal persecution of Falun Gong practitioners, especially the appalling atrocities of organ harvesting, as soon as possible. Their speeches represented the voice of justice from the British public. Member of Parliament Sarah Teather is from East Brent. In the afternoon of 15th October when attending the discussion session “China Tragedy”, she expressed concern especially over the allegations of the harvesting of organs from live Falun Gong practitioners, which she planned to raise with the Foreign Ministry. 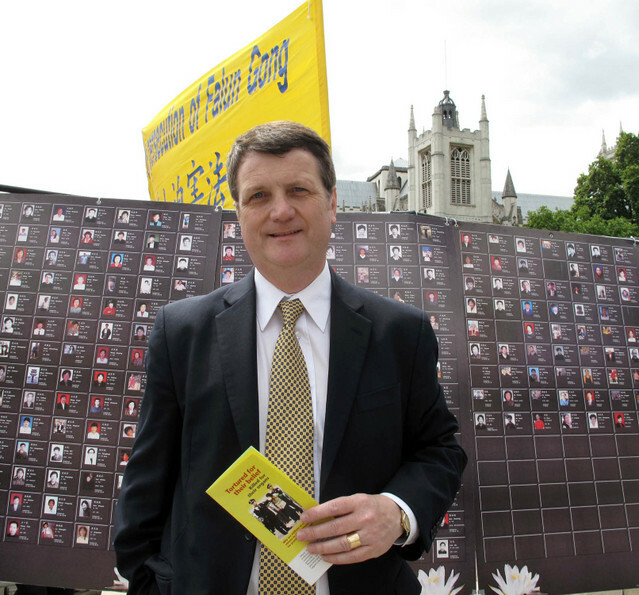 Mr Gerard Batten is a Member of European Parliament for the UK Independence Party. In his speech at Parliament Square, he highly praised Falun Gong practitioners’ courage in resisting the persecution. When interviewed, Rt Hon. Mr. Batten said, “I think it takes tremendous, unbelievable bravery for people to stand out and speak out in a country like China. We live in a free country and we all take our freedoms for granted. We don’t realise how precious they are so I think it’s a very small thing that I can come along and speak up in public for you. Liberal Democrat MP Tom Brake was named shadow Home Secretary in 2008. On the 20th of July, he went to practitioners’ gathering to commemorate the 10th anniversary of anti-persecution and was interviewed. He wished to stand together with Falun Gong practitioners whose human rights are abused and stop the CCP’s brutal persecution. The Rt Hon. Mr. Brake said he would carry out the duty of an MP and urge the British government to support Falun Gong practitioners’ basic human rights. 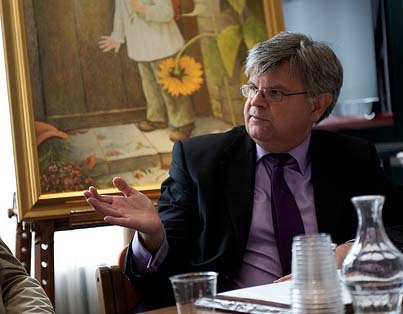 He would also contact the CCP Ambassador in London himself to discuss the same. 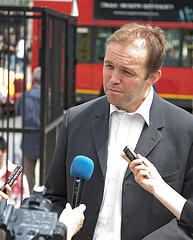 MP David Burrowes is the Shadow Minister for Justice. As a lawyer and a Member of Parliament, he has long supported democracy and religious freedom. On invitation from his constituent, he went to Parliament Square on the 20th of July to attend the practitioners’ gathering. He said, “…The horrific accounts of abuse, of organ harvesting and persecution of Falun Gong practitioners … is why I’m here to stand alongside them and to recognise the abuse and also to say that really this ten years shouldn’t continue for another ten years, and in fact, it shouldn’t continue for another year, another month, another week, another day and it’s important that we do all we can to ensure that practitioners don’t have to come back here to be recognising what is a very grim anniversary. 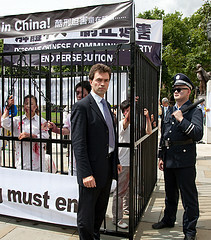 In his speech, Liberal Democrat MP candidate Neville Farmer condemned the CCP’s persecution of Falun Gong as bottom-of-the-barrel human morality. He asked the CCP to immediately stop the worst human rights abuses since World War Two – organ harvesting from live Falun Gong practitioners. Meanwhile, he called upon the British government to show a little bit of courage and take actions so as not to aid the evil. He said the public should openly condemn the CCP’s persecution and expose the CCP’s crimes under broad daylight. 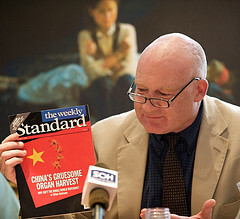 When interviewed, he stressed time and again that the UK government must not turn a blind eye on the CCP’s atrocities of organ harvesting. He urged western governments to ban organ transplant business and deter citizens from buying live organs from China to avoid killing more Falun Gong practitioners. Businessman, China expert and writer Mr Ethan Gutmann also penned the book Losing the New China. Three years ago he started research on the persecution of Falun Gong, which he is currently writing a special volume about. 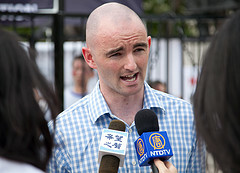 Christian Solidarity Worldwide Public Affairs Officer Mr Matthew Jones said in his speech that he supported Falun Gong’s anti-persecution efforts. He said, “The CCP has a history of persecuting religious groups, such as these mainland Chinese who hold different beliefs, including Falun Gong practitioners and Christians who do not believe in Communism. I love China very much. I have been paying attention to the regime’s persecution of these groups.